BlackBerry smartphones come with a default set of folders for users to store software, including RIM’s own standard tools–like its Calculator and Memo Pad applications–as well as third party apps and games. The four main app storage folders are Applications, Games, Instant Messaging and Downloads–at least if your BlackBerry is running OS v4.6 or higher. Applications is where all RIM’s native apps live; Games is for, well, games; a number of IM programs, including AIM and Google Talk, can be found in Instant Messaging; and any and all new apps you may acquire land in Downloads. That’s all fine and good for new BlackBerry owners, but thanks to the recent release of BlackBerry App World, RIM’s mobile software store, getting your hands on new software has never been easier. And those four folders fill up and become disorganized awfully quick. Luckily, you can create your own BlackBerry folders, which can be organized in the way that best suits your needs, in just a few simple steps. Once you’re a master of the BlackBerry folder, check out my “BlackBerry Bible” for more valuable tips and tricks. Creating a new BlackBerry folder for storing applications or other data takes just three steps. One: On your icon- or application-screen, click the BlackBerry Menu key, which is located directly to the left of your trackball. Two: Choose Add Folder from the options in the corresponding pop-up menu, and choose a name for your new addition. 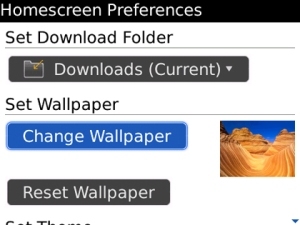 Three: Click the Icon section of the Add Folder screen, and pick the color or graphic that best fits the folder’s intended purpose. Voila! A new BlackBerry folder should now appear on your icon screen. Should you wish to modify the folder’s name, color or graphic in the future, simply scroll over it, hit the BlackBerry Menu key again, and choose Edit Folder. There’s no right or wrong way to organize the folders and applications on your BlackBerry; try experimenting a bit to see which arrangements work best for you. However, the following tips can be used to shape your BlackBerry folder organization strategy. 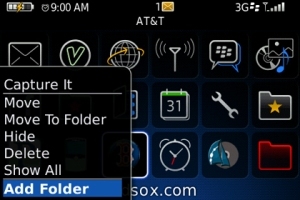 Any folder on your BlackBerry can be moved and shifted around your icon screen. To do so, scroll over the folder you wish to move, click the BlackBerry Menu key and choose Move . A white outline appears around the folder, and any movement of your trackball moves the folder. Unfortunately, you cannot currently create new folders within folders, which could really help with BlackBerry organization. And it may be a while before this functionality hits a BlackBerry near you–if it ever does; I’ve been experimenting with a very early unofficial version of RIM’s upcoming BlackBerry OS v5.0, and the feature still isn’t present in the new firmware, though it could be eventually. One tweak within BlackBerry OS v5.0 that will help: You can easily change the folder for downloads, so new applications can be delivered directly to the appropriate folder, instead of landing in the Downloads folder first. 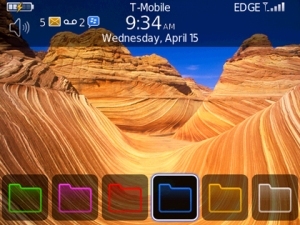 For new folders, you can choose from a variety of colors–green, purple, red, blue and yellow–along with a number of icons, such as stars, hearts, smiley faces and the BlackBerry logo. Using color codes and/or icons will help you remember what types of applications are in which folders without having to physically scroll over them to see app names. For example, you could use the color red to signify that a folder is work-related. So a red folder with a star titled “Applications” could house apps like WorldMate Live and TetherBerry, along with ERP, CRM or whatever other corporate apps your IT administrator may have distributed. And a red folder with a smiley face icon could be for your most frequently used, work-related software. 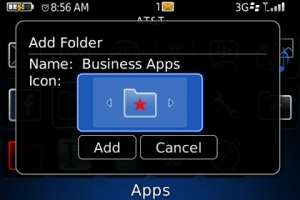 A blue folder with a star could be used to store all your personal, or life-style, apps, like Viigo, Facebook for BlackBerry and TweetGenius. Again, these specific examples may not work for you, but find your own organization strategy by testing out the above-mentioned suggestions and seeing which work best.